Farrington's Kenneth Faumui went up and over the Leilehua defense to try to pick up some extra yards during the first half of last night's game. Farrington did something last night that no other team has been able to do lately -- run effectively against Leilehua. As a result, the Governors turned it on in the second half and broke open a close game with 21 straight points on the way to a 28-10 victory in the first round of the Oahu Interscholastic Association football playoffs at Aiea. The Govs (4-5), who play OIA Red West champion Mililani next weekend in the quarterfinals, also contained highly touted Mules quarterback Bryant Moniz, who returned from a collarbone injury after five weeks on the sidelines. "We know those collarbone injuries and we knew he was going to come back," Farrington coach Randall Okimoto said. "We prepared for them (and Moniz) all week." Yardage-wise, Moniz had a good game, completing 29 of 56 passes for 258 yards. But he was off a lot, and the Govs intercepted him five times. Randy Villaver had three of those picks to go along with his seven tackles. "It was definitely the timing that was off," said Leilehua coach Nolan Tokuda, who added that Moniz did the best job he could, considering the long layoff. 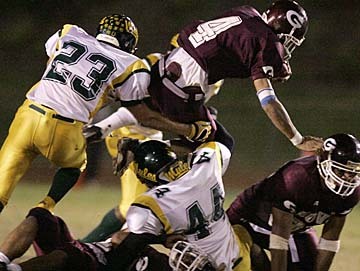 "Farrington's defense was real tough. They came a lot with the zone blitz and they had an excellent game plan for us. A lot of our kids were disappointed and doubting we could get it done when we fell behind." Okimoto said the Leilehua (4-5) receivers weren't used to catching balls thrown by Moniz. "There were some drops," he said. Kenneth Faumui powered the Farrington offense with 128 yards rushing on 17 carries, and he scored three times. His two rushing touchdowns of 2 and 58 yards in the third quarter -- and Elijah Filifili's 2-point conversion pass to Tanner Fetui -- turned a 7-3 lead into a 21-3 advantage. "This win was for last year, when we lost by one point to Leilehua in the first round of the playoffs," Faumui said "This game is dedicated to the seniors from last year." Faumui grabbed a 21-yard TD pass from Filifili in the fourth quarter after an interception by Elijah Lesu. The Mules' comeback was too late. Moniz finished off a 63-yard drive with an 8-yard TD pass to Martin Iosefo with 3:23 left in the game. In the turnover-filled first half, Farrington fought for its 7-3 lead at intermission even though Leilehua had a decided edge in offensive production. Midway through the second quarter, the Govs pinned the Mules at their own 1. But Leilehua failed to move and punted before allowing Farrington to drive 42 yards for the first touchdown of the game and the 7-3 edge. One key play in the march was Filifili's 39-yard pass to Lesu down the left sideline. Five plays later, on fourth and goal, Filifili hit Fetui with a 2-yard scoring toss and Larry Siuta added the extra point. Leilehua struck first, taking a 3-0 lead on Daniel Phelps' 25-yard field goal late in the first quarter. That score was made possible when Farrington's low punt snap resulted in Josh Truesdell's tackle of Govs punter Siuta at the 1-yard line. Still, the Mules couldn't punch it in. A 5-yard motion penalty didn't help, and they settled for the field goal. Okimoto and the Govs are looking forward to facing Mililani. "They're the No. 1 team in the West and they're really well-coached by James Millwood," he said.